Fort Yates is a city in Sioux County, North Dakota in the United States. It is the tribal headquarters of the Standing Rock Sioux Tribe and county seat of Sioux County. The population was 184 at the 2010 census. Fort Yates also served as the headquarters of the US Standing Rock Indian Agency, headed by US Indian Service Agent James McLaughlin who ordered the arrest of Sitting Bull on 14 December 1890. The 19th-century American Indian leader Sitting Bull was once buried at Fort Yates, but reports indicate that his body was possibly removed and transferred to a gravesite overlooking the Missouri River near Mobridge, South Dakota. 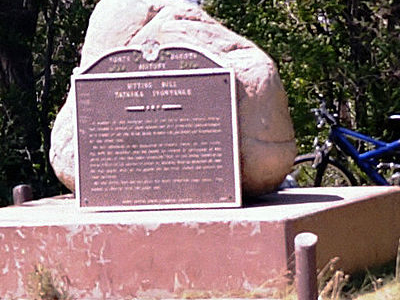 An historical marker (pictured) notes the location of the Fort Yates burial site. Sitting Bull College is in the city of Fort Yates. Here's the our members favorite photos of "Cities in North Dakota". Upload your photo of Fort Yates!